CEDAR RAPIDS, Iowa — Five years after record flooding drowned this manufacturing town and caused billions of dollars in damage, city officials and private investors are rebuilding homes and businesses on the Cedar River banks. But some people here are troubled to see structures rising in places where, not long ago, entire first stories were underwater. “Here we are investing a lot of money in a flood plain that is going to flood again,” said Rich Patterson, the former director of the Indian Creek Nature Center in Cedar Rapids. As temperatures and tides rise, severe storms strike with greater frequency and so-called 100-year floods seem to be turning into far more frequent occurrences. As a result, more cities are grappling with competing interests as they work to recover from such disasters: do they restore and rebuild what nature wiped out or do they cede to natural forces and leave waterfronts alone? Jeff Pomeranz, the Cedar Rapids city manager, said it would be unacceptable to let downtown founder. “The alternative to just stay still, to not rebuild, to allow our city to basically fumble in its core just doesn’t make sense for our city,” he said. Floods have become more expensive disasters with persistent development along waterfronts. Since 2000, floods in the United States have done nearly $10 billion in damage each year, almost twice as much as in the 1990s, according to a report released in March by the Association of State Floodplain Managers. When floods wipe out an urban area, city officials tend to favor quick redevelopment to prevent irreparable economic harm, especially in this part of the country. Small cities already face challenges in keeping their residents, especially young people, from moving away. But there is a growing chorus of conservationists and public officials who say that some land, no matter how prime it is for real estate, might be best returned to nature. They argue that it makes little sense to rebuild in flood-prone areas that will require taxpayer bailouts when the water rises again. Flooding in urban areas can send pollution downstream, and artificial protection built around cities only shifts the flooding farther down. “Somehow we’ve grown into this belief that we have an entitlement for a community to stay exactly where it is,” said Larry Larson, the senior policy adviser for the flood plain association. Iowa has had such a wet spring that the scorching drought of a year ago has all but vanished: While 100 percent of the state was abnormally dry at this time last year, practically none of it falls into that category now, according to the federal government’s Drought Monitor report released on Thursday. Cedar Rapids, which saw 10 square miles, or about 14 percent of its area, submerged after the 2008 flood, is in the adolescent stage of a comeback effort that cities along the East Coast, almost a year after Hurricane Sandy, are only starting to plan. Mayor Michael R. Bloomberg of New York unveiled a $20 billion plan last month to protect his city from rising waters, urging the need to begin the process immediately, but also acknowledging that it would take decades to implement. 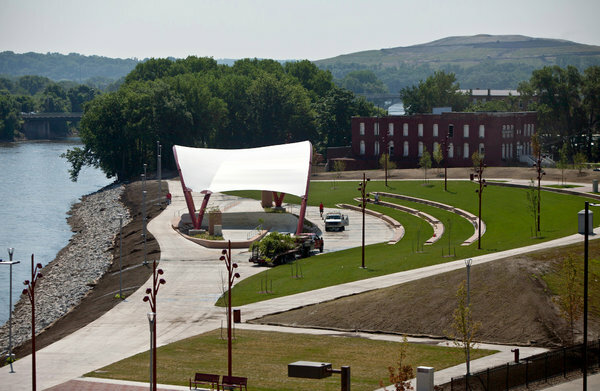 Within four months of the 2008 flooding, Cedar Rapids city officials had a redevelopment proposal in place. Five years into its effort, the city provides an example of both the hope — some parts of downtown are back stronger than before — and the hardships — many blocks remain abandoned and blighted — of rebounding from a crushing flood. “Keeping people focused for an extended period of time,” Jennifer Pratt, a planner in the city’s community development department, said of the greatest challenge in recovery. The city has bought and demolished about 1,400 homes since the flood. But the city and private developers are spending more than a combined $200 million to build 1,311 new housing units. City officials have spent $307 million in federal, state and local money to redevelop flood-affected public facilities. In the last fiscal year, the city spent more than $150 million on capital projects related to the flood and it has allotted another $136 million for such projects in the current budget. The efforts have yielded a shiny new convention center and hotel, a renovated historic theater, and a new outdoor amphitheater that also serves as a levee. Construction is close to completion on a new central library and a fire station. There are plans for new apartments, restaurants and bars on the banks of the Cedar River. In the gritty Kingston Village neighborhood on the western side of the river, city officials are moving ahead with redevelopment plans, hoping to make it a vibrant extension of downtown. Officials have reserved a plot of fresh dirt in Kingston Village for a casino that is still awaiting state approval. All this is being done even though plans to build permanent defenses from floodwaters have yet to be financed. There is a $375 million plan to build levees and flood walls on both sides of the river, but no financing has been allocated for that yet, and the city is at the mercy of Congressional approval for a large chunk of it. Local officials twice proposed extending a one-cent sales tax to pay for flood protection, but residents voted it down both times. The city recently approved a mix of retail and commercial development of four historic buildings in Kingston Village. Swaths of the neighborhood remain open, grassy fields where homes and businesses once stood but were bought out and razed. Tall bushes and cracked pavement surround boarded up brick buildings. It provides a striking contrast to the revamped downtown on the river’s eastern banks, where there is hardly a blighted patch. Even though the 2008 flood wiped out her business, Fix Salon, about a week after it opened, Juliet Pae-Corr, 31, reopened in another building in the neighborhood about 16 months later because of its proximity to downtown. Fred Timko, who is renovating a Sullivan bank building into office and restaurant space in Kingston Village and constructing a six-story condominium building, said he was confident that the city could protect against future floods. “What we had happen here in ’08, I think, was a 500-year flood,” he said.The city already has built a floodwall around its waste water plant and has raised all of its sewers. Buildings are being constructed in a more flood-safe manner and the city has invested in portable flood protection that can be used in the interim. Still, nerves here frayed last month when the Cedar River rose. The city was spared flooding that time. The best protection, some say, would be to give the river more room to breathe. Nearby Cedar Falls, for instance, passed an ordinance after the 2008 flooding that restricted development within the 500-year flood plain. Residents here suggested converting river neighborhoods like Kingston Village to parks, campgrounds, a disc golf course or even a beach. Bill Barron, the co-owner of Barron Motor Supply, which sold the city its workshop in Kingston Village that flooded in 2008, suggested planting an urban farm in the community.